Mouse over links for pictures; click for detail page. 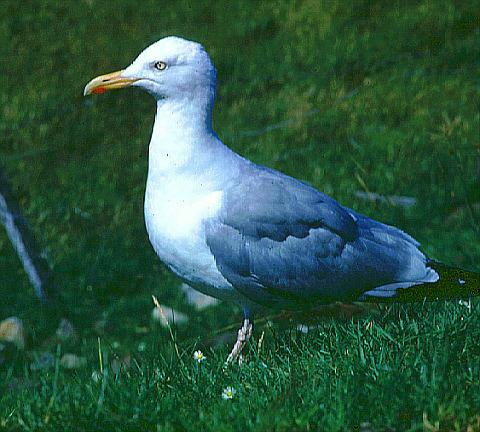 Herring gull is one of our commoner large gulls, a familiar sight on rubbish tips in winter. They nest all around the UK coast in colonies on islands or cliffs and even on secluded shingle beaches. They are vigorous defenders of their nests, frequently regurgitating food at anyone disturbing them. Great black-backed gull can be seen all year round but with a bias towards winter. It is a large robust bird which will feed on anything it can swallow, including other sea birds – even puffins! Its close cousin the lesser black-backed gull can also be seen year round but more often visits inland fields and rubbish tips. The very common black-headed gull breeds on estuary saltmarshes wherever there is a space. In winter their numbers are swelled by visitors from Europe, especially the Baltic breeding colonies. Little gull nests in northern Europe on shallow lakes and vegetated marshes and spends the winter at sea. It visits the Essex coast and reservoirs regularly mainly in the spring and autumn. Mediterranean gull is a recent coloniser of Essex. Having spread from southern Europe it now nests in small but increasing numbers on coastal marshes. Common gull is misnamed in that it is relatively uncommon, almost disappearing in the summer. In winter it is more likely to be found feeding on farmland than on the coast. Kittiwake breeds on steep northern cliffs in large numbers, visiting the Essex coast mainly in winter. When sprat shoals are about large numbers can be seen in estuaries such as off West Mersea.